In my elementary school days, before the rise of vintage fads and oversized fashion, I wore an exclusive wardrobe of my brother’s hand-me-downs, patched and re-patched meticulously in ways only my immigrant mother could do. I was, unsurprisingly, very vocally opposed – not only because being a stylistically questionable grade three girl is simply undesirable – but because I felt like those clothes, riddled with the scars and bruises of lives past, weren’t my own, regardless of how much I wore them. Simultaneously, however (though I would never admit it to my mother) wearing those clothes also imbued me with a pride that came from knowing the victories and milestones they had lived through: the ripped knees from the first home run, or the celebratory ice-cream stains from placing first in the spelling bee. In many ways, I also wore those clothes with a sense of inadequacy and uncertainty if I could truly give them a new life of adventures. Last year, I inherited the leadership of the eighteenth annual Queen’s Health and Human Rights Conference, and the emotional wave I associated with my brother’s tie-dye t-shirts and GAP hoodies flooded me inexplicably. The handover was brief and matter-of-fact: some documents, some contact information, and a few emails. And that was that: leaving me alone and clutching the leftover legacy of more than a hundred students’ ideas, passions, and hard work over the last seventeen years. I struggled with what it would mean to now drive this conference – to make it into something genuinely grounded in the contemporary frameworks and politics of our time, all the while paying homage to the original goals and values that so many before me have worked for it to espouse. I turned to the best source I knew for guidance (Google) and uncovered pieces of the conference’s past that inspired and impressed me: its appearance in the Kingston Whig Standard, its receipt of the Queen’s University Human Rights Initiative Award – multiple times, and its hosting of headline speakers time and time again. The history of conference themes also pays respect to the health equity issues that have gripped the international stage over the years: the genocide in Darfur, the HIV/AIDS epidemic in sub-Saharan Africa, and the refugee and migrant crisis worldwide. In a haphazard and overly dramatic way, I reached out to Dr. Monika Dutt, a role model I have followed (and re-tweeted) too enthusiastically over the years, and – as I discovered – the conference’s original founder and Chair. I asked her for the story of the conference, to which she chuckled softly and admitted that she and her classmates had simply hoped to create an adjunct learning experience on subjects they felt were overlooked in curriculum. Simple hopes that – as we now know – have carried forward eighteen years. 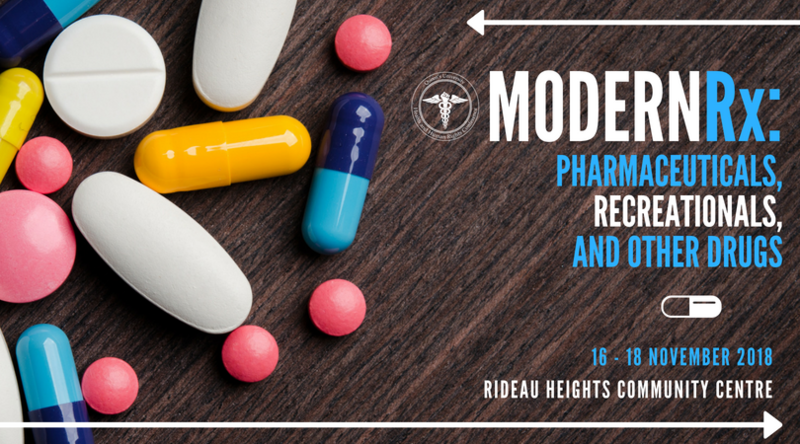 This year, the Queen’s Health and Human Rights Conference Planning Team is honoured to present our 2018 event: “Modern Rx: Pharmaceuticals, Recreationals, and Other Drugs”. Like its predecessors, the conference seeks to unpack critical and current issues – this time, in relation to the multitude of drug use, regulation, and access issues that bombard our national landscape. Inspired by the conference’s history, and determined to build the values of social justice throughout the entire planning process of our event, we have thoughtfully challenged the nature of traditional of academic spaces and who they are home to. In that vein, we have relocated the main conference venue to the Rideau Heights Community Centre, and our conference agenda has emphasized creating more space and priority for learning from lived experiences. We have hoped for change in the details, too: we have been adamant in reducing the entry fee to the event to $10.00, and using half of the proceeds to fund the Kingston Community Health Centre, whose staff have been ever gracious in offering their time and mentorship throughout the process of conference planning. We have aimed for sustainability and environmental responsibility in our catering choices, our purchase of gifts and accessories, and our use of a shuttle bus to bring attendees to the conference. We have aimed for diversity in our roster of speakers and in our invited attendees, and have tried to include as many voices in the space we have created as we can. We acknowledge, however, that even in our attempts to remain as true as we could to these values, there were limitations, and we hope that our audience will also be critical to this and learn from the event in light of its strengths, but also of its weaknesses. I hope that you will consider joining us at the annual Queen’s Health and Human Rights Conference on November 16th – 18th, 2018. This event has evolved in many ways over the last seventeen years, and I hope this year will not only do justice to its past, but will continue challenging the future of the conference to continue in its journey to becoming more critical and more responsible to the values it represents. Your presence, in this journey, would be invaluable to us.